When Hannah begins hanging out at a popular teenage club “The Sloop” and starts dating the charming and clever Damian, Sophie suddenly feels left out. With each day, Sophie notices Hannah drifting farther from her. Before the friends can reconcile, the village is thrown into fresh panic when Sophie fails to return home after a high school dance—and is never seen again. 2014. Hannah is living the life most young women dream of as a successful columnist for a fashion magazine in New York City. But after years of being the party reporter, documenting the revelries of the rich and famous, she craves a deeper subject for her writing. Quitting her job and leaving her former glitzy Manhattan lifestyle for a run-down apartment in Brooklyn, she spends her days writing a biography of three famous authors: Agatha Christie, Barbara Follett, and Virginia Woolf—three women who struggled with family, loyalty, and ambition… three women who one day disappeared without a trace. Belgian author Meuleman's fascinating, multilayered debut shifts between countries and time periods. After the miscarriage of a much-wanted child, Hannah, a successful society columnist for a high-profile New York fashion magazine, is desperate to change her life. She leaves her husband, quits her job, and moves from Greenwich Village to Brooklyn's Bushwick neighborhood. Her plan is to write a book about Agatha Christie, Barbara Newhall Follett, and Virginia Wolfe: three writers who "fought their battles, swam against the current, and then disappeared one day." Her research into why these women chose to walk away from their lives stirs up turbulent memories. It seems that her beloved authors are "dragging her back to places she needs to forget. All the way back to" Bachte-Maria-Leerne, the little Belgian town where she grew up. 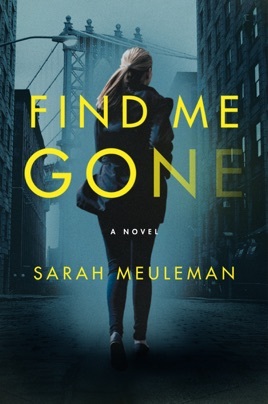 Meuleman skillfully reveals, bit by tiny nuanced bit, the story of Hannah and her best friend, Sofie, who likewise disappeared one day long ago in Bachte. This intelligently written psychological thriller provides much food for thought.